SOAP Format for recording Patient’s progress is a format that is widely used by Veterinary clinics. However, before we dive deep into SOAP it is essential for us to understand the parent document to which SOAP belongs in more detail. The parent document in the above reference is the Electronic Health Record. To put this simply, if there was a digitized version of patient’s paper chart, it would be called as an Electronic Health record. These are patient centric records that make information accessible and available to authorized users in run time. Users in this context could include Labs, Specialists, pharmacies etc. It is not rocket science to understand that this is a highly beneficial mechanism to store records leading to Improved Patient care, better coordination and cost savings. 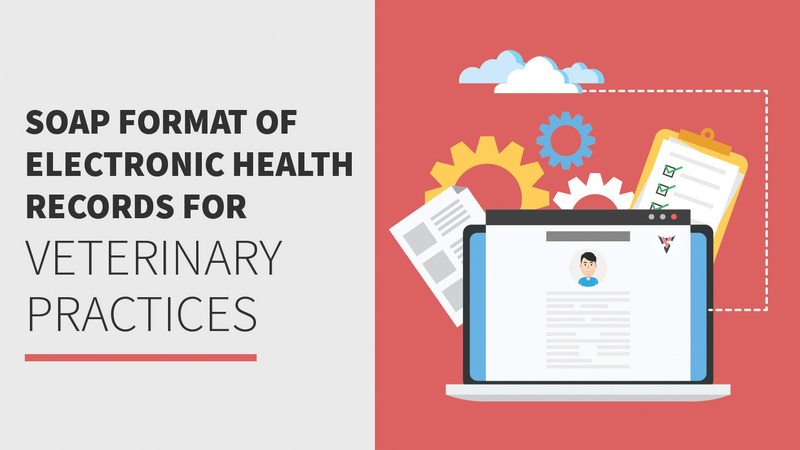 An EMR or EHR contains wide variety of information like treatment history, medical records, Patient Progress etc. SOAP finds its usage in recording Patient Progress. SOAP or SOAP notes as they are widely called also find extensive usage in Veterinary practices. It is a way for clinics to record, document and store patient’s medical information in a systematic way. It also gives the practice a framework to evaluate information without losing even the tiniest bit. This is an essential document for the clinics as well as a good piece of information used by various people to communicate about a Patient’s health. Subjective in case of clinics refers to the narrative of the patient in the form of its ideas or feelings. It can also be understood as a description of how it sees the current condition of their health. It is not easy to get a layered answer for this. It is required to ask intelligent questions from the patient’s answers to get a clear subjective idea. Failing this could lead to getting vague answers that might be dangerous to the overall well being. B. Longevity and history of present illness. This is the step where the most of the consolidation work happens. The subjective data collected in the first case and the objective data in the second step is critically analyzed, relevant portions taken and the practice tries to make the diagnosis here. The main challenge at this step is that different subjective and objective data can lead to different diagnosis; veterinary doctors must use their wisdom to the fullest to lead to a focused diagnosis, which serves as the input to the next step. The assessment is also likely to have possible etiologies of the patient’s problems. The practice should also mention the overview of the patient’s progress since the last visit made to the practice. Once the clinic makes the assessment notes, the next step is to decide the course of action. This course of action comes in the Plan. The plan includes all the details, which the veterinary wants to suggest or instruct the patient in order to solve the diagnosis of the patient. The plan can include recommending more tests in the lab, more radiological work, referrals, procedures, medications etc. Also noteworthy is the point that if there are more than one diagnosis in the assessment phase, the plan is to be made for each as well. 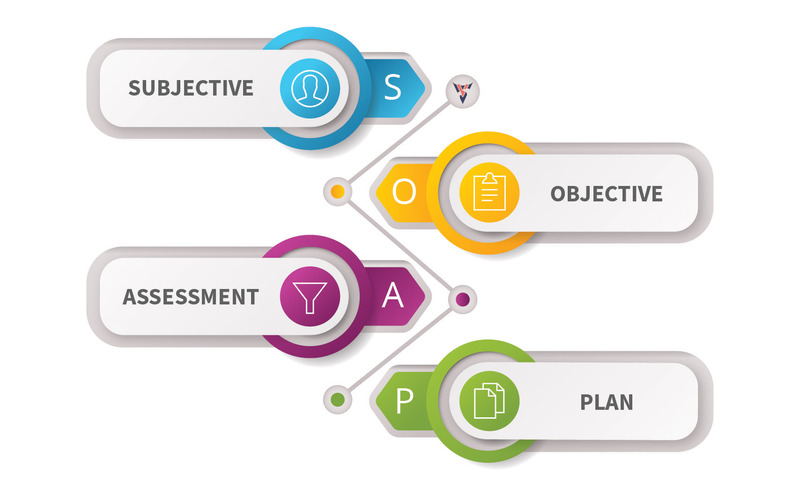 A comprehensive SOAP document has to factor in all subjective and objective information, accurately analyze it, come up with an assessment and make plan based on all of these as inputs which eventually solves the patient’s problem. SOAP is advantageous since it more or less standardizes the process. It is a well organized document which has a natural progression from Subjective Info to Objective Info to Assessment and Plan. It structures the patient’s progress over time in a simple and clear format that is understandable by anyone in the veterinary field. From a Patient’s viewpoint, a SOAP note provides an efficient way of reflecting the patient’s progress, which is simple, concise and compatible with data from common assessments. A certain section of the industry also feels that the since the structure of a SOAP note is sequential, at times the integrated approach may be ignored. However, the format gives complete scope to be modified to have an integrative approach. In Summary, SOAP is an excellent format to be practiced by Clinics and Practices for it gives the diagnosis a legitimate structure. Having said that, the integrative approach in diagnosis is more sacrosanct and if it requires the format to be modified a little, it is recommended that the required modification be done.